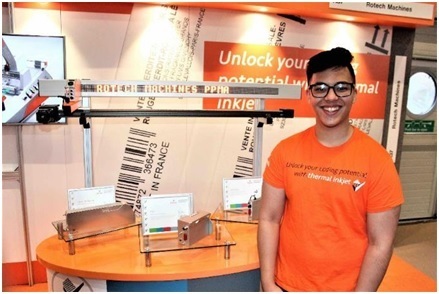 Aged just 18, Apprentice Engineer Miguel Mari is pursuing his dream job as an inventor and problem solver with Rotech, a designer of feeding and coding systems. He already has high ambitions to make himself indispensable to the SME, and has taken charge of several technology challenges, including designing the lighting rig featured on Rotech’s recent stand at PPMA Show 2018. Miguel is the third pupil from The Marlborough Science Academy, St Albans to embark on an apprenticeship with the machinery maker after Rotech’s managing director Chris Baker strengthened links with the school. In November 2016, the year 11 student joined his engineering classmates at an open day hosted by Rotech. The event made an immediate and positive impression on Miguel “It helped me to realise before taking my GCSEs that it was possible to take a non-traditional route into engineering and that there is a lack of qualified applicants with the practical skills,” he reflects. Starting the two-year apprenticeship a week before his GCSE results were announced, Miguel attends college two days a week to study a BTEC in Electrical Engineering. “My alternative path was to take maths, physics and chemistry A levels. Although these subjects interested me, I figured that they would be too general and wouldn’t have helped me in reaching my end goal of designing machinery within such a short timeframe,” notes Miguel. Having spent two months in Rotech’s assembly department, Miguel swiftly moved into the machine design and modelling team where his inventiveness and self-taught problem solving abilities are clearly valued. He has become the ‘go-to’ expert for a number of technology challenges, including wireless networking. With practical assignments underpinning the Rotech learning experience, Director Richard Pether handed Miguel a bunch of routers with the instruction to “take as long as you need to connect 28 printers wirelessly.” It took the eager apprentice just five hours to set up the network and he currently remains the only team member to have solved it. “Figuring this out was my proudest career accomplishment to-date,” says Miguel who has also worked on projects to document ink usage and print on packaging upside down. “It’s really satisfying to know that I am their right hand person for solving specific technical challenges,” acknowledges Miguel, stressing that job variety is one of the real benefits of undertaking an apprenticeship with a smaller enterprise. “It also allows you to be more entrepreneurial and take ownership of a project,” he adds. “There are very few companies where engineers can have an idea, build it, show it to colleagues and be given the credit for it,” claims Miguel. For Miguel, these projects and challenges have helped him to discover where he really shines and has given him the motivation to climb the ranks and eventually completed a degree part time while progressing within the company. “My plan is to keep going and learn to drive this year so I can get to customer sites to perform machinery installations and servicing. Ultimately, I hope keep growing with Rotech and take on a leadership role in the near future,” adds Miguel.